In its native tropical environment, the coconut, or Cocos nucifera, is a source of food and is used in traditional medicine to treat skin infections, upset stomach, wounds, bronchitis and coughs. Coconut oil may have anti-inflammatory and fever-reducing abilities. It also contains vitamin E, vitamin K and the essential fatty acid, omega-6. Coconut oil is obtained when dried coconut meat is put through a high-pressure expeller that squeezes out the oil. Coconut oil is suited to cooking at a high temperature and has a long shelf life. It’s frequently found in processed foods, such as fried foods, desserts, non-dairy toppings and crackers. Unlike most vegetable oils, coconut oil is high in saturated fat. One cup of coconut oil has 218 g of total fat, with 87 percent of the fat content consisting of unhealthy saturated fat. It also has 3.92 g of omega-6 fatty acids, according to the USDA Nutrient Database. The omega-6 fatty acids are healthy polyunsaturated fats, but they only represent 1.8 percent of the total fat in coconut oil. 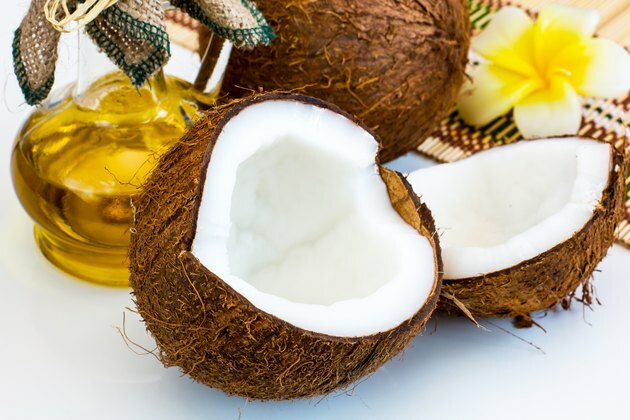 The American Heart Association recommends limiting saturated fats to less than 7 percent of your total daily calories, and this includes limiting the amount of coconut oil, even though it provides omega-6 fatty acids. Omega-6 is called an essential fatty acid because it’s needed for healthy functioning and it must be obtained through your diet. Omega-6 is used in cell membranes to create flexibility and permeability. Even though it’s unclear exactly how it functions in the brain, there is a high concentration of omega-6 in the brain, according to the Linus Pauling Institute. There are different types of omega-6 fatty acids. One type may reduce inflammation and protect against arterial disease. A second type is converted into chemical messengers that tell the body to begin the inflammatory response. Inflammation is part of the healing process used by the immune system when the body is injured. However, prolonged inflammation can have a negative effect on the cardiovascular system. A second type of essential fatty acids called omega-3 promote an anti-inflammatory response, so it’s important to consume a balance of omega-3 and omega-6 in your diet. Coconut oil does not provide a balance of essential fatty acids because it does not deliver omega-3. In the June 2011 issue of the "Asia Pacific Journal of Clinical Nutrition," Alan Feranil, et al, reported that coconut oil is not associated with increased cholesterol or triglyceride levels.